Go West on Hwy 15, North on Manley, West on Grandview, North to Hills of Hackberry Subdivision to Manorwood Lane. All Appliances, All Window Coverings/Treatments, Fountain on back patio, 3 planting pots on front porch, 3 planting pots on back patio. Hello, I’m interested in N3076 MANORWOOD LANE and would like to take a look around. 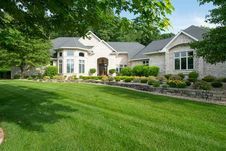 The details on N3076 MANORWOOD LANE: This house located in Hortonville, WI 54944 is currently for sale for $885,000. N3076 MANORWOOD LANE is a 6,571 square foot house with 3 beds and 4.5 baths that has been on Estately for 259 days. This house is in the attendance area of Hortonville Elementary School, Hortonville Middle School, and Hortonville High School.